What Makes Kids Kick is the first in a series of books by Fran Kick. Designed as a compass of thought for use by educators, youth group leaders, parents, coaches and others who are currently working with today’s postmodern kids. The book provides a framework though which to view today’s kids by exploring themany influences and inspirational factors that are affecting the Millennial Generation (born 1980–2000±). Fran Kick has combined a comprehensive collection of studies, surveys, research articles and news stories with his own anecdotes, gathered over two decades of traveling across the country talking and working with kids and the adults in their lives. As entertaining as it is informative, What Makes Kids Kick will get you looking at and thinking about this generation of kids in a new way. It will help you raise, teach, manage, lead and mentor a more self-motivated generation of kids who will have the attitude and skills necessary to KICK IT IN & TAKE THE LEAD! Fran’s broadly generational approach to today’s kids is very nicely executed. While he’s familiar with youth up close and has a voracious appetite for interesting facts, he also sees the big picture. I learned a lot. There are things in here that I didn’t know and I make a living doing this! What Makes Kids KICK is filled with good advice for coaches, educators, parents and anyone else who works with kids. Fran Kick presents a thoughtful and research informed approach to engaging youth, packaged in a lively and vital way. His work recognizes not only that getting kids involved is beneficial, but that making it fun and meaningful is essential to making it happen. What fantastic books!!! I gave my sister, who is a high school counselor in Scottsdale, the What Makes Kids Kick@Home one. Your graphics are always so stunning and they are on this book as well. I really enjoyed What Makes Kids KICK. Positive, well thought-out and researched, lots of good ideas, fun to read, plus great resources. Covers all the ground of Millennials Rising and more, but in a more accessible way. It’s a home run! 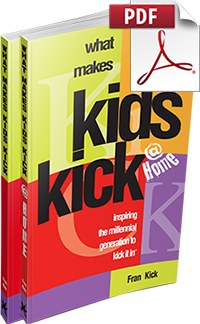 Fran Kick knows kids inside out, and he gives real-world practical ideas for those seeking to parent and teach them. This book provides a wealth of amazing resources and usable tools to KICK IT IN with kids of all ages! SAVE WHEN YOU BUY BOTH BOOKS + PDF eBOOKS TOGETHER!